New rubber grips from KontrolFreek has launched called the FPS Havoc, and it arrives just in time for the launch of Medal of Honor: Warfighter and Call of Duty: Black Ops 2. The grips themselves are laser-etched analog extenders with a neat design and precision enhancing control. 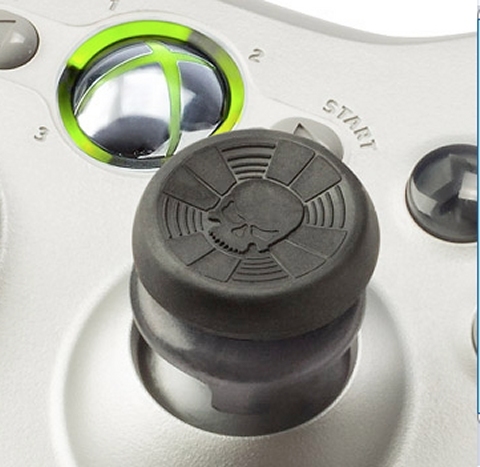 KontrolFreek focuses on enhancing analog controls by using grip extenders. The grips can enhance precision control by up to 40%, enabling for much smoother and faster precision aiming for first-person or third-person shooters. The grips also help with getting the most out of the analog's extension range, which is sometimes vital for games where you have to sneak around utilizing stealth mechanics. The FPS Freek Havoc has a pretty cool design, basically it's a skull in the center of a grip with radar waves extending outward from the center. Technically the logo could very well apply to just about any FPS game out there, but attaching it to Call of Duty: Black Ops 2 really gets the interest juices flowing, eh? You can pick up a pair of the analog grip extenders from KontrolFreek's online store for only $13.99 and the grips work for PC, PS3 and Xbox 360 controllers. If you want to check out more info on the grips or see a few more pics, feel free to visit the Official Website.